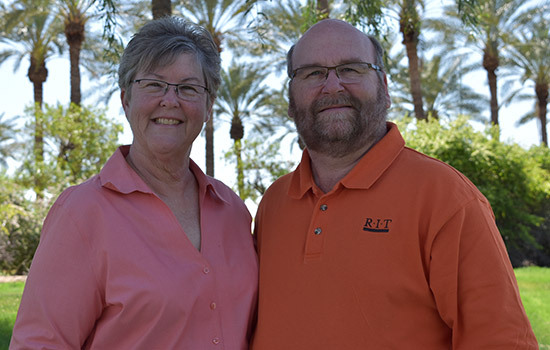 Even though retired NTID faculty members and alumni Barbara Ray ’74, ’84 and Samuel ’77 Holcomb now live across the country in Arizona, it does not mean RIT and NTID are far from their hearts. The couple, with a combined 75 years of service to the university, is also keeping their connection to NTID alive in another important way by helping to preserve NTID’s history. Both are involved in efforts for an NTID Alumni Museum. Throughout their long careers with RIT and NTID, the Holcombs amassed a trove of memorabilia, from old textbooks to video phones, which they hope will be featured in the museum one day. Many items from their collection are already featured in the Deaf Studies Archive in The Wallace Center, which they were instrumental in helping to create. For these efforts, Barbara Ray and Samuel will be honored as the NTID 2017 Distinguished Alumni on Oct. 13 at the RIT Presidents’ Alumni Ball. Along with their work to preserve NTID’s historic materials, the former instructors have brought another of their passions from RIT to their new community—teaching. They conduct workshops for their local deaf community on subjects like technology and teach American Sign Language to the senior citizens in their area.